In most situations, family members or friends of deported parents step up to take care of the kids, often without knowing how long the responsibility will last. But when no caregiver can be found, the system gets complicated. San Diegans have a front-row seat for how President Donald Trump’s immigration enforcement policies will affect undocumented families over the next four years. It’s a concern that impacts an outsize number of students in California. An estimated one in eight students in California schools have at least one parent who is undocumented, according to Education Trust-West. Most of those students are in the U.S. legally. 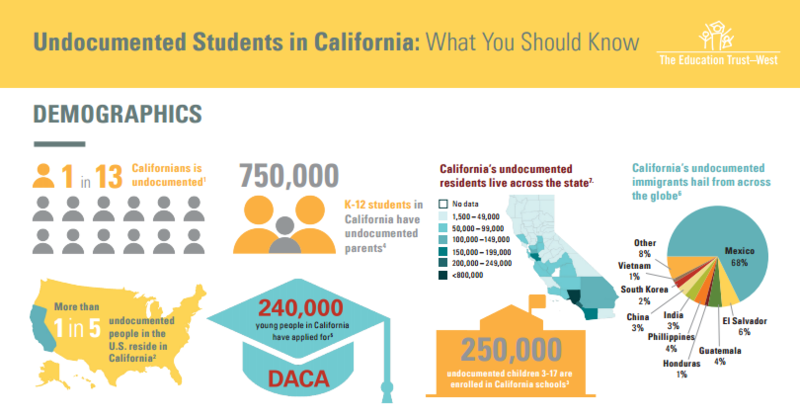 Of the estimated 750,000 K-12 students in California who have an undocumented parent, 250,000 are themselves undocumented. For school districts, that means grappling with how to reassure parents their students are safe in schools, while not over-promising protections on which they can’t deliver. In February, San Diego Unified Superintendent Cindy Marten sent a letter to parents, assuring them that immigration agents wouldn’t be allowed to conduct raids on school campuses. The letter followed a resolution San Diego Unified passed a month earlier, which affirmed the district’s commitment to making sure that schools are safe spaces for all students, regardless of religion, ethnicity or immigration status. In line with guidance from state Superintendent Tom Torlakson, school districts up and down the state passed similar resolutions. While school officials and immigrant-rights advocates see the resolutions as meaningful symbolic gestures, they have little meaning for the federal agencies charged with enforcing immigration laws. For a while now, we’ve been hearing stories about U.S. Immigration and Customs Enforcement trucks stationed near local schools. And while it’s tempting to attribute this to Trump – whose administration has effectively made every undocumented immigrant a priority for deportation – reports of ICE officers stationed near schools aren’t new. Many parents are sketching plans for who will care for their children should they be suddenly detained. In most situations, family members or friends of deported parents step up to take care of the kids, often without knowing how long the responsibility will last. But what about those kids who don’t have anyone else? That question, though it may seem simple, gets complicated as we look closely at the programs that are supposed to help children in those circumstances. So we pulled together some local experts to help us field those questions. Is ICE allowed to come into schools? Yes. But experts say it’s unlikely that will happen. In 2011, ICE issued an enforcement action memorandum that prohibits agents from entering sensitive locations – like schools, hospitals and places of worship – without a warrant. Currently, that memo is still in place. As local immigration attorney Ginger Jacobs told us in February, however, the Trump administration certainly could change the policy. Still, Jacobs told us, it’s highly unlikely ICE would make schools the focal point of immigration enforcement – partly because it would likely spark intense protest from the community. Can ICE get permission to go inside a school and detain an undocumented child? Undocumented children are subject to the same protocol as an undocumented adult. So while San Diego Unified and many other school districts have said they won’t cooperate with federal agents who enter schools without a warrant, there’s little stopping ICE agents who do have one. That said, Vanessa Dojaquez, senior immigration supervisor at the International Rescue Committee of San Diego, said it’s much more likely ICE would make contact at the family’s home. “If they want to enter a school, they still need permission from some type of supervisor or administrator there. Now, if ICE knows where that child lives, and they can get a valid warrant from judge to enter the home, they can do that, and that is much more likely than trying to enter their school,” said Dojaquez. Can ICE be around the perimeter of a school? In March, ICE sent shock waves through a largely immigrant neighborhood in Los Angeles when they detained a father who had just dropped his child off at school. His daughter, who recorded the apprehension from a cell phone, is heard sobbing in the video. An ICE official told the Los Angeles Times that because the arrest was not carried out on school grounds, the apprehension was in line with the department’s policies. In February, ICE agents apprehended a group of Latino men leaving a church shelter in Alexandria, Va. Like schools, churches and places of worship are considered to be sensitive locations. And while so far there haven’t been any reports of similar detentions outside San Diego schools, parents and school staff members have spotted ICE trucks near schools in the past. Staff members at one elementary school in City Heights said when that’s happened, it’s been followed by a sharp decline in parents who are willing to engage with the school and attend school functions. One undocumented parent in City Heights, who asked to remain anonymous due to fear of deportation, said bringing her children to school provokes tremendous anxiety. “I rarely go drop off my kids at schools in the morning because I go into work at 4 a.m., but when I do go I fear that it will be my last day here,” she said. Let’s assume a parent gets detained by ICE, what generally happens to his or her children? San Diego Unified is one of many local school districts that have offered informational sessions for parents, providing resources about their rights and advising them to create an emergency safety plan for what should happen if parents are suddenly detained. Those safety plans should list adults – preferably a U.S. citizen or someone who wouldn’t face deportation – to be contacted if parents are detained, children’s medical information and how to access bank account information. If the parent gets detained near his or her child’s school, the school will contact the individuals listed in the child’s emergency contact list. “It’s very similar, and this is very morbid, to if someone passes away unexpectedly, making sure that you have someone in your life, and maybe multiple people, that have that information,” said Dojaquez. Let’s say parents are detained and there’s nobody else to care for the child. What happens? If parents are unavailable, and no other caregiver can be found, the ultimate backstop for the child is the foster care system, said David Loy, legal director for the ACLU of San Diego and Imperial Counties. These situations are rarely clear-cut, and involve a complicated intersection between immigration law and juvenile dependency, he said. Carolyn Griesemer, executive director of Children’s Legal Services of San Diego, said that before a child is taken into the foster care system, the courts must first determine whether there is jurisdiction to intervene. In other words, the state can’t simply remove a child from a parent’s custody without a legal reason. In most of the cases the county sees, children are removed from parents due to allegations of abuse or neglect and the child is at risk. It’s more complicated, however, if the need for foster care is merely that a child has been left behind because his or her parent has been deported. Under such circumstances, the relevant state law could be Welfare and Institution Code 300(g), which applies to any child who has a parent who is unable to provide care or support to the child, which could occur in the event of a deportation. If the child’s situation fits that criteria, and no other qualified guardians can be found, the county would file a petition on behalf of the child in juvenile dependency court. The child could be taken into custody, and would be appointed an attorney to represent his or her best interest. If there is no other relative or appropriate caregiver, the child could start out at Polinky’s Children’s Center, a temporary emergency shelter for children in Kearny Mesa, before they find a more permanent home. Griesemer said that her office hasn’t seen uptick in those cases in recent months, which she credits in part to community organizations that have spread word about what parents should do if they’re facing deportation. And because social workers are most often able to find family members or friends who are willing to step in as guardians and care for children, the courts haven’t really had to get involved in many cases yet. Are children who are taken into custody reunited with their parents? Yes. One of the main tenets of the foster care system is that there must be a plan to reunify children with their parents whenever possible. If, for example, a child is removed from parental custody because the child was exposed to drugs, the parent may have to take substance abuse classes and follow any number of steps before they regain custody. This, of course, gets trickier when the parent is deported from the United States. Still, social workers make plans to connect children with their parents if possible. That may mean having a relative drive the child down to Mexico to visit with their parents. Or, more commonly, the child would simply leave the U.S. with his or her parents after they’ve been deported. Roughly half a million children enrolled in Mexican schools are U.S. citizens, according to the Mexican government. Another half-million were born in Mexico, lived for a time in the U.S. and returned to Mexico. Those kids often suffer gaps in their education, or struggle in school because of limited Spanish – the mirror image of their counterparts in the U.S. But they’re with their family. Who should parents contact for legal advice? Immigration law is incredibly complex. Each person’s case is unique and tied to factors that include how long an individual has lived in the U.S and his or her ties to American citizens. Your best bet is to consult with a licensed, reputable immigration attorney to go over the facts of your case. You can also find information on immigrant rights, advice on creating an emergency safety plan or see a list of immigration attorneys at readynowsandiego.org. Border Report: Once Deported, This Mom Will Spend Christmas at Home in the U.S.